a combination of a microscope and a narrow beam of collimated light, used to examine the eye. an instrument used in ophthalmology for examining the external, surface, and internal segments of the eye, including the eyelid(s), lashes, conjunctiva, cornea, anterior chamber, pupil, iris, vitreous, and retina. A high-intensity beam of light is projected through a narrow slit, and a cross section of the illuminated part of the eye is examined through a magnifying lens. 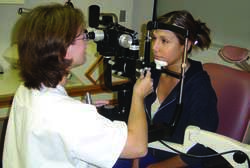 A second, hand-held lens is used to examine the retina. ophthalmology An instrument consisting of a microscope combined with a rectangular light source that can be narrowed into a slit for examination of the eye. A microscope that projects a linear slit beam of light onto the eye; allows viewing of the conjunctiva, cornea, iris, aqueous humor, lens, and eyelid. Grade A (minimal) PVR was seen on slit lamp as diffuse vitreous haze and tobacco dust. Kowa Optimed and the SL-15 slit lamp can be found at booth number 3739 in Hall G next to the Academy Resource Center and the AAO Learning Lounge. According to hospital authorities, a daily patient turnout of around 200 is recorded at the eye clinic where the Slit Lamp is installed. Eye ball hanger is a simple instrument designed by us in Department of Ophthalmology at Kamineni Institute Of Medical Sciences, Narketpally, with available resources which enables us to examine and grade the donor corneas of enucleated eyes using regular slit lamp and Specular Microscope (Topcon SP 3000 P). It is often conducted when your health care professional sees a lack of a tear pool during the initial slit lamp examination and finds dry areas in one of the stain tests. But it is not until I revert back to a halogen-illuminated slit lamp that I realise just how much of an improvement the LED illumination makes to detailed observation. 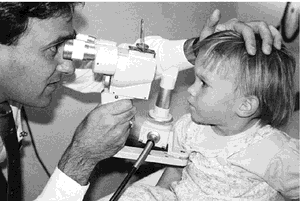 03 Apart from the cornea, which other ocular structure is this slit lamp technique most often used to examine? The BI 900 slit lamp boasts an enhanced 14mm LED illumination. 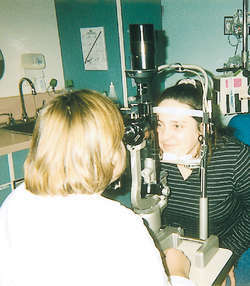 The subject of the procedure is the purchase and delivery of ophthalmic equipment cabinet including: a non-contact tonometer, tonometer impressionistic Schioetza, slit lamp, table ophthalmic, dioptriomierza auto, LCD Panel, Test Flies, Ishihara Test , autorefraktometru with keratometer, perimeter computer, cassette test glasses frames assay, defined in Annex 2 to the siwz. TOPCON'S LATEST slit lamp, the SL-D701 (pictured left), provides bright and clear LED illumination and it is ready for digital interface with the 'DC-4' photo attachment and the 'BG-5' LED background illumination system. Tenders are invited for Purchase of one slit lamp with imaging for eye deptt. HAAG STREIT (HSUK) has announced that the Clement Clarke Ophthalmic 'BA904' portable slit lamp (pictured) is now fully compliable with the stringent third edition standards, IEC 60601-1.